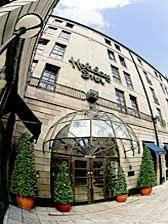 Located in Glasgow's fashionable theatre land district, this award winning hotel offers superbly appointed, air conditioned rooms as well as spacious executive rooms, sumptuous penthouse suites and Wi-Fi access throughout. To say we are a favourite among guests who choose hotels in Glasgow for short breaks, shopping trips, theatre breaks or business meetings is certainly true. However, we like to think winning Intercontinental Hotels Group's Torchbearer Award for 3 years running, proves our point and puts us ahead of other hotels in Glasgow. Thanks to the hotel's superb location in Glasgow's city centre, you are just steps away from the King's and Pavilion Theatres, the Royal Concert Hall, the best shopping outside London, as well as many restaurants and bars, including our own AA Rosette winning La Bonne Auberge Brasserie. Other attractions include the famous Kelvingrove Art Gallery, the works of Charles Rennie Mackintosh, the Glasgow Science Centre plus the SECC and Clyde Auditorium. The picturesque sights of Loch Lomond are within easy reach too. Set within an exclusive residential area to the South of Edinburgh's historic City Centre, this traditional hotel features a newly refurbished modern interior, whilst still retaining its original character and charm. A welcome alternative to city centre accommodation, the Royal Ettrick Hotel enjoys a peaceful position on the outskirts of the city, yet just a 15-minute bus journey away from all that Edinburgh has to offer. The hotel is also within walking distances of 2 of Napier University's campuses, Merchiston and Craiglockhart. In addition to 17 beautifully-decorated guestrooms, the Royal Ettrick Hotel features a light-filled Conservatory Bistro, serving a full menu throughout the day and restaurant dining in the evening. In the summer months, al fresco dining is available in the private garden. City Apartments are ideal for today's sophisticated guests, who like that special feeling of having their own home when they are away for business or leisure. These fantastic 4-star apartments offer the luxury of an up-market hotel with the added freedom of your own space. Linen, cutlery, crockery and utensils are all provided. Centrally located in Glasgow on Bath Street, your self-catering city apartment is near to many top-quality bars and restaurants. All major transport links are close by. If you want a home from home in Glasgow, but still expect the facilities of a luxury, modern hotel, a serviced city apartment will exactly meet your needs. Set in the heart of Glasgow's West End, in an excellent location just a 5-minute drive away from the city centre, this listed building boasts glorious Victorian architecture. The Lomond Hotel Glasgow offers the ideal location to take advantage of the city's sensational nightlife. You will be amongst a wealth of cosmopolitan bars, clubs and restaurants clustered around areas of the West End, such as Woodlands Road, Byres Road and the elegant Ashton lane; a cobblestone path by the Prestigious Glasgow University's campus, filled with stylish caf?s, bars, restaurants and a cinema. If you want to venture further afield, the hotel's position boasts excellent transport links; the nearest undergound stop is Kelvin Bridge, and the number 66 bus stops on Great Western road. Just 2 minutes by free shuttle from Edinburgh Airport, this hotel with extensive facilities is located 7.5 miles from Edinburgh's city centre. The hotel boasts 22 meeting rooms for 2 to 300 people, as well as the LivingWell Health Club with its 17-metre indoor pool, gym with weights equipment, and sauna. All guest rooms have high-speed internet access (at an additional cost). A courtesy bus runs 24 hours (on demand) from the Hilton Edinburgh Airport Hotel to and from Edinburgh Airport. Green Hope nestles in the quiet seclusion of the Whiteadder river valley in the Scottish borders. Once a traditional stone built cottage, now thoroughly modernised and very spacious and comfortable. The windows open onto the sparkling river, a country lane and woodland walks teeming with wildlife. Malmaison Aberdeen is a stunning luxury hotel with sumptuous rooms, a sophisticated brasserie, a diverse spa and endless exquisite designs, style and flair. 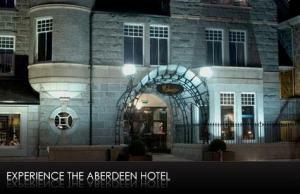 Formerly the Queen's Hotel, the boutique Malmaison Aberdeen is part new-build, part original fa?ade. Other special features include the gym and the wine-tasting cellar. In addition to the brasserie with its excellent wines, the Whisky Snug is a cosy corner where you can sip fine whiskies from over-sized tartan armchairs. Exceptional 4-star accommodation on Edinburgh's famous Royal Mile and throughout the Old Town, offering professional design for a stay in comfort and style. Choose from a 1-bedroom apartment with garden terrace sleeping 2 guests, to a 3-bedroom apartment sleeping 6 guests in 3 double bedrooms. Each property includes a fully equipped kitchen, quality furnishings and a comfortable living room. 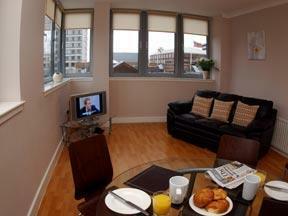 St Giles Apartments provides all the comforts and privacy of home, and is a very attractive alternative to any hotel. A 5-minute walk from Murrayfield Stadium, Dalry Apartments offer comfortable accommodation ideal for family groups, a 5-minute bus journey from Princes Street and Edinburgh Castle in the city centre. Dalry Apartments provide a range of 1, 2 and 3 bedroom apartments, with facilities including a well equipped kitchen with a fridge, microwave and washing machine. There is a comfortable lounge and features such as a TV and sound system. Nearby attractions include the EICC convention centre and the Scottish National Gallery of Modern Art. The Golf View in Prestwick overlooks Prestwick Old Course and is minutes from rail and air links, 20 other golf courses, tennis and sailing. The sea and beautiful Arran can be seen from the elegant guest lounge on the first floor, where you can also enjoy a drink. Your warm, friendly hosts provide excellent service. The 6 beautiful rooms are charming and come with crisp linen, fluffy towels and plenty of little extras. Enjoy a gourmet breakfast in the dining room overlooking the golf course. Set in over 44 acres of grounds, the hotel has every comfort and modern amenity you would expect from a 4 star hotel. The hotel is a great base for touring Scotland. Edinburgh and Glasgow are within easy travelling distance by car. Each of the 106 luxurious bedrooms at the Inchyra Hotel have been tastefully decorated and designed for relaxation - why not treat yourself to added luxury with an executive or superior room? The hotel is a perfect place to stay for either business or pleasure - we provide fully equipped meeting rooms for the use of our business customers. You can also enjoy our wide range of leisure facilities, including health suite, swimming pool and all-weather tennis court. On Scotland's west coast, with stunning sea views across the Firth of Clyde and the islands, this recently refurbished contemporary hotel is situated on Largs' seafront Promenade. 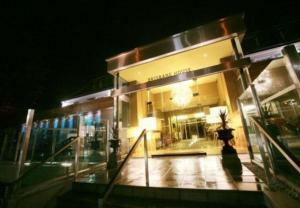 Comfortable and modern, the Brisbane House Hotel has 24 en suite rooms, many with sea views and 2 with en suite jacuzzis. 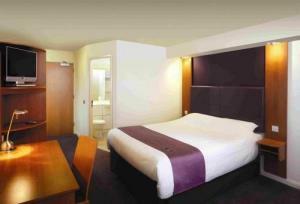 All rooms have TVs, hairdryers, trouser presses, irons and ironing boards. Wake up calls and newspapers are available on request. The all-new Brisbane Suite and Henry's Bar and Restaurant feature floor-to-ceiling glass, stylish, modern design and great views of the Ayrshire Coast and out to sea. Menus include traditional Scottish dishes, North American classics and European favourites. In warmer weather, you can dine outside on the terrace. Room service is available 24 hours a day with a limited menu available after 21:00. The hotel is just a short walk from Largs' golf club and from the ferry that will take you to Millport, Rothsey and Dunoon. Stornoway's most historic hotel, the Royal nestles in the heart of Stornoway, beside the marina, where you can relax, enjoy the hotel's cosy character and enjoy dining in our Boatshed Restaurant or in HS1, the town's 1st cafe bar. If on business, you'll probably appreciate free wireless internet access available throughout the hotel. What matters so much more than bricks and mortar, though, is the warmth of the welcome and the friendly, easy service you'll receive - for the Hebrides has a great tradition of hospitality. While the Royal Hotel enjoys a delightful view over the colourful, bustling harbour to the splendour of Lews Castle and its grounds. The town centre is only around 200 metres walk. 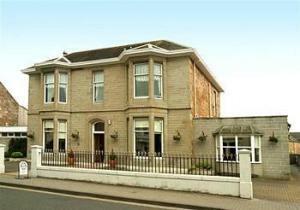 The Ivy Rooms - 11 Miller Road, Ayr, Ayrshire, KA7 2AX. 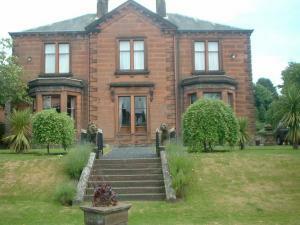 The Ivy Rooms is a converted Victorian house situated 5 minutes' walk from Ayr town centre. Rooms are bright, contemporary and have en suite power showers. Highly trained management, chefs and reception staff provide a high level of service. The comfortable, modern Ivy Rooms is 15 to 20 minutes away from several golf courses. Golf packages can be arranged. In a quiet street with views over the River Tay and the park, the value-for-money Shaftesbury Hotel is close to the city centre, university, Ninewells Hospital and main shopping area. Many of the original features at the Shaftesbury remain, giving the building lots of character. The rooms are all very spacious; each is furnished differently. The bar is large enough for a good crowd, yet remains intimate. A wide selection of malt whiskies can be sampled in the Garden Bar. The hotel's licence is restricted to residents only, so you can be sure of a quiet, relaxing evening. Due to the age of the building, the Shaftesbury Hotel does not have a lift. Situated in the heart of Falkirk, The Antonine Hotel is the perfect base from which to explore Falkirk, Glasgow and Edinburgh, with good motorway and train access. 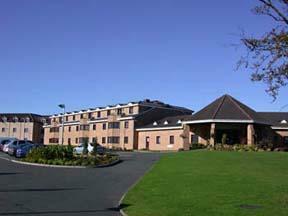 Most rooms have striking views across the central belt of Scotland to the Ochil Hills. 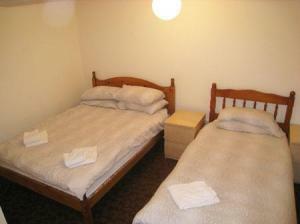 All rooms are contemporary, with en suite facilities, satellite TV and a hairdryer. The hotel has a modern bar and a comfortable lounge.The Charioteer Brasserie offers traditional Scottish cuisine in a relaxing environment, along with Spanish tapas. 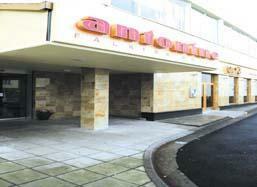 The Antonine Hotel is just a 1 minute walk away from the main shopping boulevard and the attractions of the town centre. A warm welcome to The Angus Hotel, Blairgowrie's premier leisure hotel and one of only 4 hotels in Perthshire with a modern, fully-equipped leisure club and indoor swimming pool. Relax and unwind in a very informal family-owned hotel, offering a delightful combination of professional service and comfort with a true concern for customer care and environmental standards.